The walk started off wet but, the weather picked up and we had nice views of splega dam and surrounding area after completing walking butter, craigdoo and splega. After all the rain of Friday, the sun shone brightly along the coast road out of Larne. At the Knock Dhu car park above Cairncastle, six hardy walkers, Audrey & James, Nigel, two Peters and myself set off along the hilltops, among slightly lowering cloud, our route taking us over Scawt, Ballygilbert and Blacks Hill. The mist quickly cleared as we descended towards the delightfully named Crockandoo. where we had lunch.Then a pleasant walk along the road down to Glenarm with clear views across to to the Mull Of Kintyre. Our walk ended at the pub on the main street with festive drinks ie hot ports and beer and the chat was of Xmas and bare knuckle boxing oils. Thanks to all for a good day out. 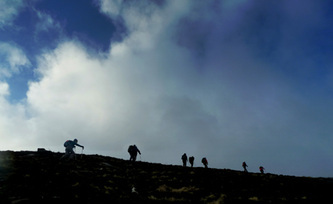 A hastily arranged walk resulted in 10 intrepid Spartans turning up at Meelmore Lodge to begin their hike up Bearnagh. Although the weather was cold we were lucky to have reasonably clear skies and sunny spells and once we started climbing it didn't take long to warm up. We stopped for a breather at the col between Bearnagh and Meelmore before moving on up the steep slopes of Bearnagh. At the top we were rewarded with beautiful clear views but the chill factor meant we couldn't stay long and had to drop down a bit for our lunch break. We then descended down to Hare's Gap then up Slievnaglogh before heading down the 'green lane' and back to Meelmore lodge for a warming cuppa. Thanks to Henry for the photos. An early start from Leitrim Lodge and a cold eleven Spartans commenced their walk along the open farm tracks to our destination of Wee Roosley. A small summit by all accounts, however there Wee Roosley stood proud at 320m high in the morning sun with an attractive open saddle with valleys and foot slopes. 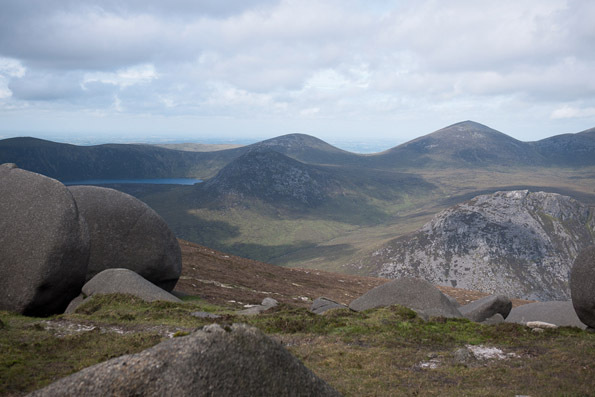 It wasn’t long before we reached Reid’s Hall for a brew; a tall corridor of granite rock which opened up the panoramic views to the dramatic horizon of the Mourne Mountains and into the intricate patchwork of the valleys below. Another fence climbed, and as we approached Slieve Roosley at 362m, Henry was able to identify all the summits in the skyline and I have attached a printed copy for your perusal. Following the road back to Yellow River car park we joined the Ulster Way and returned to Leitrim Lodge. A great moderate 13.5 walk exploring new terrain but with too many fences. Thanks to all my Spartan friends. Walk led by David Wiggins. Very enjoyable day out in new terrain. The first walk since the clocks changed and the day had dawned bright but piercingly cold. Layer after layer went on in the Carrick Little carpark but the walk in and up allowed us to drop off some of the excess. We went in by Annalong wood but rather than the usual ascent on Binnian by the wall, we went up steeply by a further wall to the plateau by Binnian Lough and hence onto the summit ridge for lunch - glorious views along the way our only encounter with a farmer herding his sheep down to the valley for the winter. to the pros and cons of their strategies. We took a quick break by Blue Lough and back to the cars comfortably by 4pm. Thanks to all for a grand day out. The drop in temperature forecast for the weekend was definitely noticeable as we ascended to the Windy Gap from Trassey Car Park. The sky was reasonably clear though with interesting cloud formations and the views were good. There was a powdering of ice and some treacherous frozen water that was extremely slippy. We found a sheltered spot on the eastern side of Bearnagh's torrs for lunch and then descended to the Hare's Gap. The hills were a beautiful russet colour under the strong autumnal sunlight. 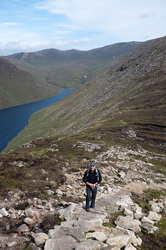 Our way back was by ascending Slievenaglogh and over Lukes Mountain. A very pleasant walk for the thirteen participants. There were around a dozen walker on the walk on Saturday. 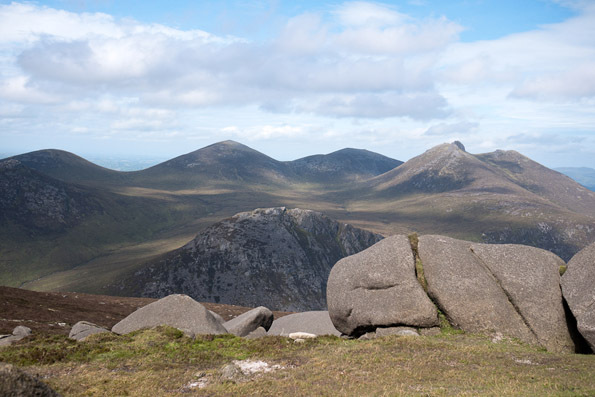 It was a day where the clear skies from lower altitudes soon dominated the hilltops as well and we had beautiful views all around the high Mournes and beyond. Stephen led us up from Ott lay-by and then along the wall to the tops of Slieve Loughshannagh, Meelbeg and Meelmore - where we stopped for lunch. 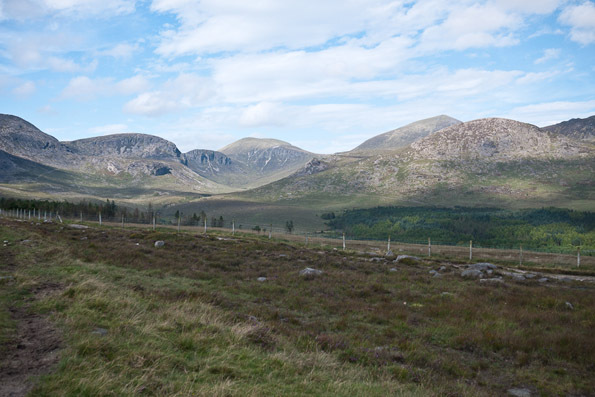 We then went back into the Happy Valley and over the snout of Meelbeg to the edge of Fofanny Dam. Several people were taking advantage of the good weather and setting up camp there for the evening. We were soon back at our cars and enjoying a farewell cuppa in Meelmore Lodge. Thanks Stephen. A great day. Ed and Helen organised the twenty walkers who had turned up at Laragh Lodge below the waterfalls at Glanariff, by arranging a taxi to take us to the start of the walk at Ardclinis Bridge. We were to begin the walk by following the river that ran out to the sea here - Cushenhilt Burn. The weather cleared to a bright and breezy early autumnal day. We quickly gained the 280 metres from sea-level to the top of the waterfall and turned west to find the top of the cliffs overlooking Waterfoot. We now had the view which would accompany us for much of the remainder of the walk - the valley of Glenariff with Lurigethan and Crockalough beyond. The blue water of Red Bay and the hazy shadow of the Scottish coast beyond. descended to cross Altmore Burn which runs out of Lough Natullig and descends quickly and cuts another gully into the valley below. Glenariff Forest Park and back to our rendevous point at Laragh Lodge. A fantastic walk with super views along the Antrim Hills. Thank you to Ed and Helan for such a great walk. A sunny Saturday morning and the car park attendant (aka Alan Rooney) shuffled the coloured cars at Game Keeper’s Lodge. Once gathered, a group of fifteen set off full of energy and enthusiasm for the walk that lay ahead. 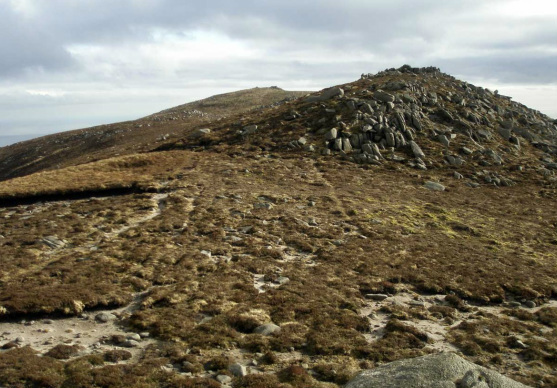 We left the track and made our way across the blanket bog to Slieve Muck. Camouflaged amphibians lay hidden amongst the deep purple bell heather to protect them from the predators above. On reaching the silarian shales which over-lie granite at 450 metres, we stopped to sip our morning coffee and take in the views of Carlingford Lough and beyond. 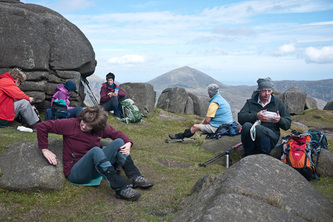 Coffee break over, it wasn’t long before we reached the trig point of Slieve Muck (674m); where we once again refuelled. Our descent was laboursome as the terrain was saturated and trying to negotiate an alternative dry route proved difficult. Indeed, some of the Spartan Olympians (Marion) slipped in spectacular style demonstrating a double pike with a twist. Unscathed, Marion remains a true competitor! Overall, a super day’s walking! A 13 km moderate walk with good company: what better way to spend a Saturday!! Torrential rain on Friday night left me poring over the map looking at wet weather option (tollymore forest anyone?) but Saturday dawned dry though overcast and 10 spartan showed up to Bloody Bridge car park. The forecast warned us that the weather would deteriorate so we selected a route up the bloody river track, onto Slievenagarragh and hence to Chimney Rock itself where, despite occasional showers, we were rewarded with views over the Annalong valley and to menacing clouds in the distance. We descended with equal promptness - managing a very respectable 10km in our 4 hour hike - past the youth groups jumping into the river and back to the cars long before the proper rain hit. When Friday night’s weather forecast put an end to plans to go to Rathlin Island David Flynn had to frantically ring round to alert those booked. As an alternative he proposed a walk in the Mournes, but given the heavy clouds and grim forecast it probably wasn’t too surprising that I was the only one to turn up at the Trassey car park to join David and Rachel. Apart that is from a large group of people who were doing a long charity walk and had probably thought that a day in mid summer was just the day to do it. Our original intention was just to do a loop of Tullymore forest. It was raining when we started, a reasonably gentle rain that turned to light drizzle and then stopped completely as we walked through the woods, and it was quite pleasant. So much so that when we came to the wall and the stile below Slievenabrock it seemed obvious to give it a go and do a bit of actual hillwalking. Clever weather. 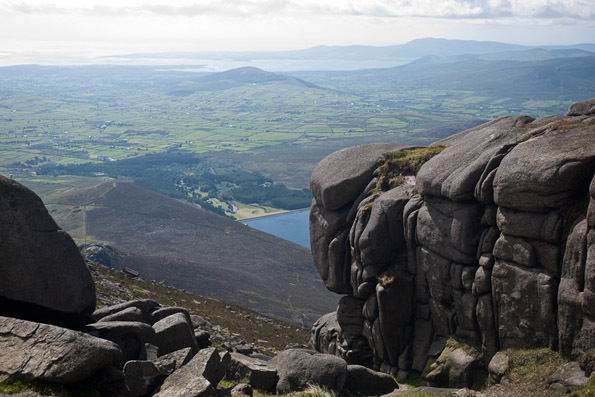 As those of you who have been there know the slope up to Slievenabrock is very pretty, has great views, is quite steep, and has absolutely no protection whatsoever. We were about half way up when it started to rain again, much heavier than before. It was a pretty grim struggle, and a very wet one, but we got to the top eventually, when naturally the rain stopped. As did we, any notion of maybe going on to Commedeagh now washed out. seen (or heard) the Shimna/Tullymore so fierce. Impressive to watch. And back to the car park, a little bit damp but glad that we gave it a go. Thanks to David for keeping up the tradition of a Spartan walk (almost) every Saturday. Hopefully Rathlin will be back on again in the not too distant future. And it couldn’t be much wetter than yesterday, even if we swam all the way! A beautiful Saturday morning in Newcastle town. Sun block applied as 11 Spartans boarded the 9.30am rambler bus bound for Ott car park. Upon arrival, Elaine and Nigel joined the group as we followed the track towards Doan. The air was cool as the sun tried to burn off the morning cloud. 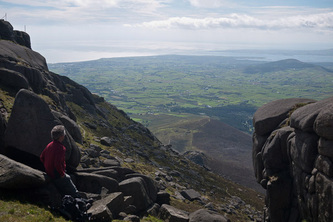 The panoramic views where magnificent from the central summit of the Mournes. Our descent from Doan was steep as we headed to cross the Ben Crom river and down to the Dam where we happened upon Barbara, Angela, Helen and Marion. 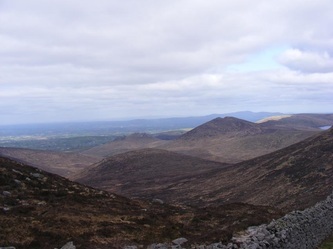 brandy pad upto the saddle of Slieve Donard and returned down the Glen river. Great walk had by all. For once the forecasters had thrown caution to the wind, and we were promised "wall to wall sunshine" for Saturday. And for once they were right. So it was great that Marie Doran had volunteered to fill a gap in the programme and even better that she had devised such a novel route, well off the beaten track for the most part. Our rendezvous was Donard Car Park, at the rear of O'Hare's bar and once mustered there, we shared cars for the transfer to Bloody Bridge. With several Spartans in shorts, copious amounts of suncream were applied and we sallied forth up the track to the Mourne wall. The sky was blue, the sun was strong overhead, and there was, mercifully, a slight following breeze. But how envious we were of the children who were having a dip in one of the rockpools on the river. Under their dad's supervision, they were having a whale of a time jumping into the pool. 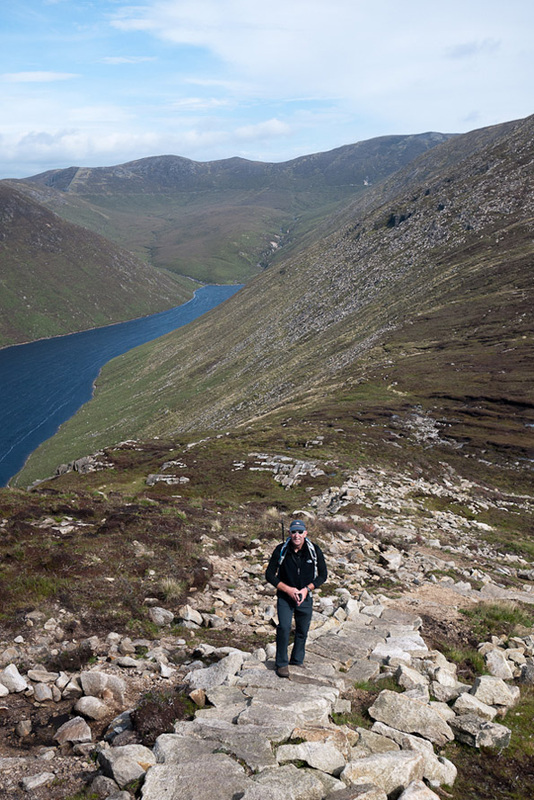 It was, of course, another excuse for a brief halt to get our breath back and top up on water as we made our ascent. The views got better and better as we gained height and the visibility was remarkably clear as we gazed back down to the coast. We crossed the recently installed footbridge and after noting the remains of the old mineral cable way on our left, we took a left for Chimney Rock Mountain. Soon we were making the final ascent to the rocky summit, which mercifully was our main lunchstop. Sheltered from the breeze, the heat was beautiful and we were able to lie back and imagine we were on some Mediterranean beach, except that the scenery was miles better. heat another refreshment stop was ordered below The Castles, from where we had a splendid view of the Devil's Coach Road, the challenging walk which Simon Reardon is leading on June 2 - although we were assured there were alternative ascents. 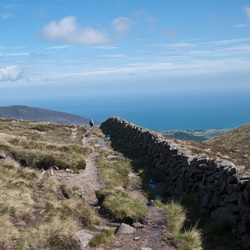 Then it was uphill to the wall, just above the Donard saddle and so to the summit of Commedagh where a mid-afternoon break was ordered. Here we 13 Red Sox became 15 as the aforementioned Simon Reardon and the indefatigable Sammy Magill materialised. 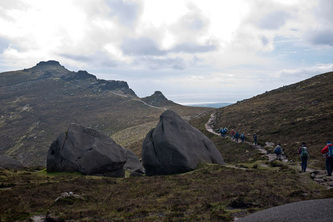 They had been up with the lark, caught the Mourne Rambler bus to Ott car park and were walking back to Newcastle. Food for thought for another outing. weather was always like this. Just shows the tourist potential of walking, mind you. And it was noticable throughout the day that the good weather had attracted numerous groups of walkers to the Mournes. Busier than I have ever seen it. 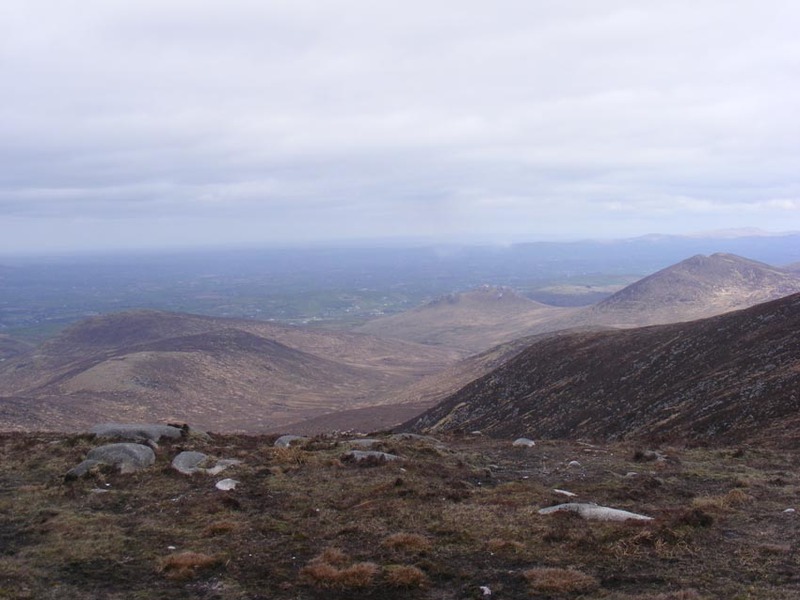 On then, down thankfully to the shade of the forest and so to Donard Park, where some of us repaired to O'Hares for some refreshment. We had covered around seven miles, and the walk had, as promised, taken six hours, with our arrival back in Newcastle being just a couple of minutes after 5pm. A leisurely pace, with plenty of time to admire the scenery. In that heat, it would have been unwise to attempt to break any records. A relaxing and restorative day, in good company with great chat. Many thanks to Marie for planning such an original route and acting so capably as leader. We followed the path through the trees - with bluebells and wild garlic amongst the variety of plants here and we were soon walking underneath the impressive basalt buttresses of Binevenagh itself. Our walk took us under these buttresses to the western end of the cliffs where a gentle climb brought us to the top of Binevenagh and a great view in wonderful light. We could see the panorama of north Derry fields stretching out to the Magilligan sandhills and strand. Lough Foyle sweeping round from it's narrow entry at Magilligan Point. 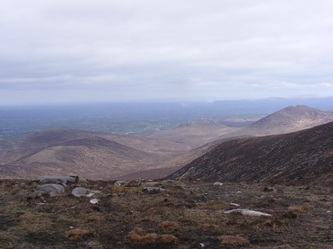 Further to the west we could see the hills of Inishowen and beyond the distinct shape of Muckish. 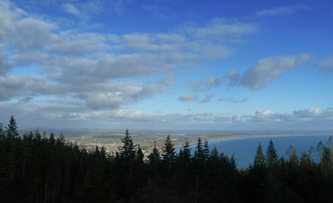 We lunched and watched the gliders from the nearby Ulster Gliding Club as they rode the updrafts from Binevenagh. After lunch our route took us back to the lower slope on the eastern side and back to the cars at the church. We finished the day with a refreshing walk along Benone Strand toward Downhills and the sentinel of nearby Mussenden. A great days walking - Thank you Dorothy. The group of 19 congregated at our three self-catering houses in the small hamlet of Naran beside Portnoo. We mostly arrived in the evening and went to the local bar for a pint and a bite served from the adjoining “restaurant”. On Saturday morning David and Rachel had arranged for us to meet their friends, James and Livvie who are members of The North West Mountaineering Club and familiar with the area. Our rendezvous was the Old School House above Crolack farm - the starting off point for the walk known as The Blue Stack Five. 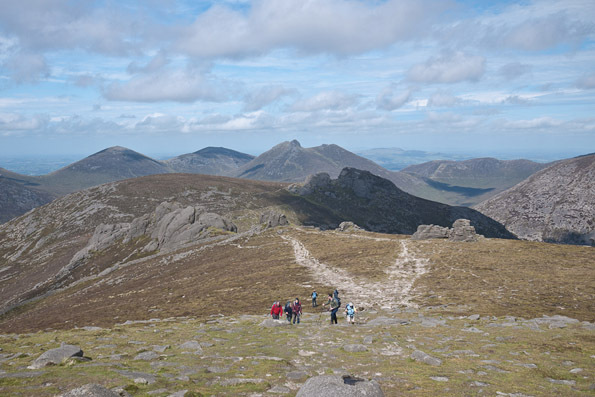 The walk is aptly described in Tony Whilde & Patrick Simms’ Walking Guide for West & North Ireland - A 10 mile walk with an ascent of 2500 ft and a walking time of 6 to 7 hours. 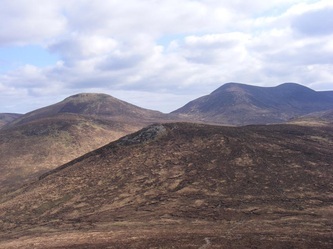 The Blue Stack Five are the hills – Glascarns Hill; Croughbann; BlueStack; Lavagh More; Lavagh Beg. For those who completed the walk, the book mentions the … “scant remains of a Sunderland aircraft which crashed in January 1944. 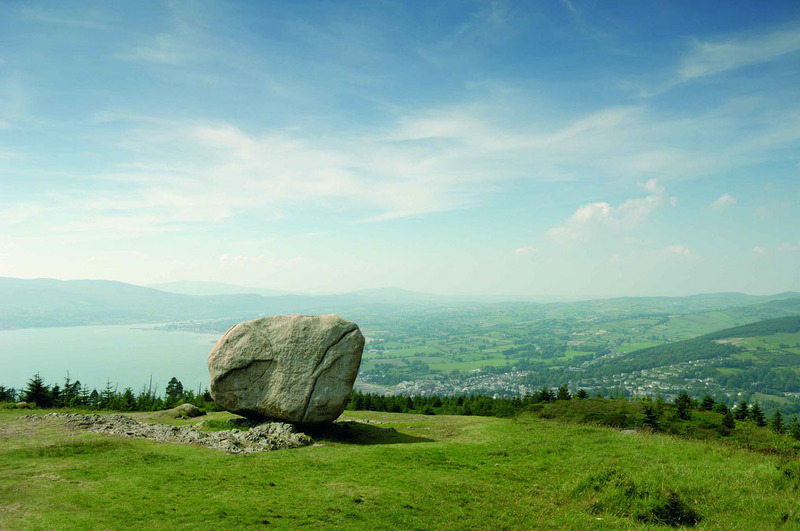 “… “Parts of the wreckage, which lay around a stream, were removed in 1990 to a local history museum in Glenties. Although the weather on Saturday had a gun metal feel to the light, it was clear enough and dry. With a little suggestion of snow and a temperature that changed from quite cool to reasonably warm – although that may have been due to the exertion on my part. 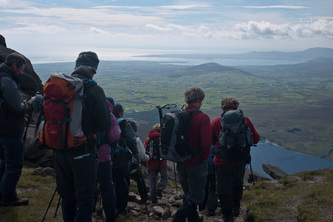 We had a break on Croaghbann and shortly after we could see Lough Eske far below. The views were actually very good. 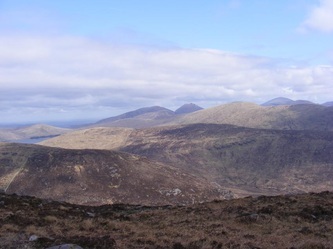 The whole of Donegal seemed visible – with Slieve Snaght to the north and the Glover skyline beyond (Errigle/Muckish etc); Slieve League and Slieve Toohey to the west and Donegal Town and Donegal Bay to the south and the hills of North Mayo. We could see Cuilcagh on the Fermanagh/Cavan border and Lower Lough Erne. The height that we had gained early in the walk on Croaghbann and maintained for most of the walk was lost a little as we dropped to Sruell Gap …”The route used by bare-footed pilgrims travelling up the Sruell valley on their way to Doon well near Churchill”. A last stiff climb to the top of Lavagh More and we were treated to great views back over the main ridge. A long descent over Lavagh Beg and back to the starting point where we startled a Hare which ran out from the field boundary and then sat still a few yards from us. A long and enjoyable day in the Bluestacks and we were all ready for home and a gratefully received meal and time to rest and relax. Sunday was a super day – with bright sunshine and blue skies. The plan today was to do a coastal walk and it turned out to be a super walk too. We began from the houses and made our way to the small harbour at Portnoo. We looked out to the small island of Inishkeel where as the tide has receded, we could watch people walk across the sandy causeway to the old Church and cemetery there. Beyond to the north was the Island of Aran More just off from Burtonport. We passed along grassy headlands and rocky outcrops with little inlets and sometime steep cliffs and the island of Roaninish out beyond now. The sound of the sea and occasional sound of the bird and indeed sightings- a group of choughs…and quite a few frogs hopping out off our path and even a common lizard. I didn’t even know that we had such a thing. 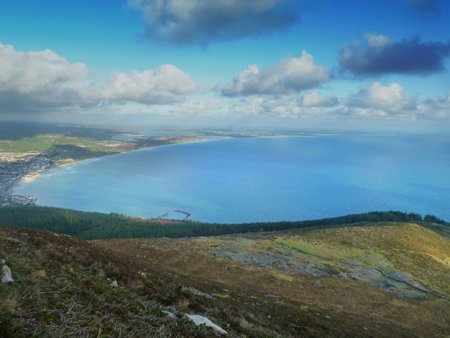 Our walk took us around Dunmore Head and close to Aghros Point before we came to the road north of Kiltooris Lough. Our finishing point was the pier at Dawros Bay. A pint in Nancy’s in Ardara before heading back to the houses and a meal in the Lakeview Hotel. The damp and grey weather on Monday morning curtailed most of us from further ramblings and the drive home began. A super weekend though and a big “Thank you” to David & Rachel for going to so much trouble and organising it all for us. - Fantastic. Six Spartans walked from Pigeon Rock to Slieve Mageogh, Eagle Mt., Slieve Moughanmore and back to Pigeon Rock carpark. Good weather all the way. Attached are some photos of the walk. Thanks for the walk Simon. There were twelve in the group that met at the busy Trassey Car Park on the Trassey Road. From there to the Hare's Gap, we were accompanied by those participating in at least two events that day. So a reasonably crowded walk to the Hare's Gap itself. From there to the Shelter Stone area at the top of Ben Crom Reservoir we saw very few other people and enjoyed the gradual descent to the dam for lunch - noting just how low the water level was for the time of year. After lunch we followed the Kilkeel River back up to the Brandy Pad - passing the actual Shelter Stone on the way!! 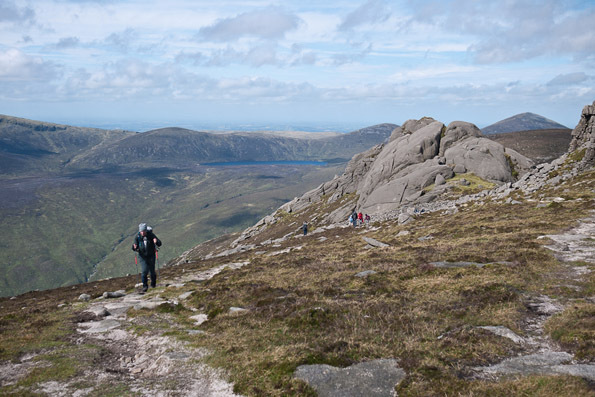 We reached the Mourne Wall on the top of Slieve Corragh and followed it along to the top of Slievenaglogh. After crossing the wall we descended to Lukes Mountain and finally back through the blossoming gorse on the lower slopes before making it back to the carpark. The forecast for the day was showers (some heavy at times and slow moving) with bright intervals. 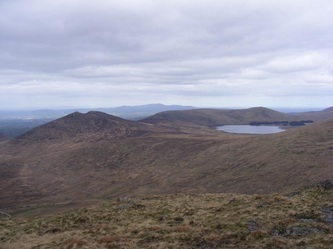 Eleven of the group met at the specified place, beside Glenshane Forest. The rain was there to meet us too!! Alan had us all well organised with printed copies of the route for the walk and a bag of Haribo Starmix for each of us and off we set across Altrasna Bridge and into the Glenshane Forest. We followed the path through the forest with views of the river, moss covered trees and a startled heron until we came to The Priest's Chair - a Mass Rock nestled amongst the trees, just off the path and marked on Alan's map as "First Break"!! After resting and snacking as the rain slackened for a time, we climbed a slippery bank out off the forest and onto the side of our first summit, Bohilbreaga (478m). The cloud had lifted and broken sufficiently for us to see out to Lough Neagh and to Slemish and the Antrim Hills in the east and with Slieve Gallian to our south and the typical Sperrins valley below with Moneyneany and Draperstown in the mid-distance and Banagher Forest creeping up the sides of Mullaghmore, our next high-point and also our lunch stop. tranmitter masts on the top the summit of Mullaghmore - our highest point for the day. As we did so, the cloud lowered and the masts temporarily disappeared. After some "softer" ground, we were happy to stand on the narrow service roadway which we followed for a few minutes before veering north east to White Mountain and further east to Glenshane Mountain where we had our Afternoon Break and even the weather calmed for a moment and we enjoyed our views back into the Glenshane Forest and our start/finish point overlooked by the forlorn Ponderosa!! 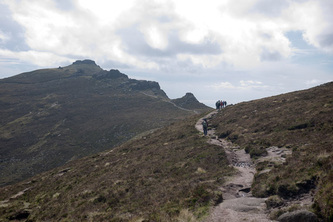 The final section of the walk was no less demanding than the previous soft and boggy ground, as we now climbed a section of leg-tiring tussocky heather terrain to reach the southern spur of Corick Mountain. From here, we followed the fence to the northern end of the forest and were happy to be on a forest path to finish our route back to the traffic busy A6 Glenshane Pass road - the heavy rain accompanying us right back to the cars. A fine walk with a variety of terrain and views - where the precipitation could not dampen the invigoration of a rewarding day in the Sperrins. Thanks Alan. From the upper carpark in Kilbroney forest, 17 Spartans walked to the top of Slievemartin and from there to Knockshee. Lunch was enjoyed on the slopes of Knockshee with stunning views of Carlingford Lough. We returned to the carpark via Rostrevor Forest covering a total of 9 miles (14km). 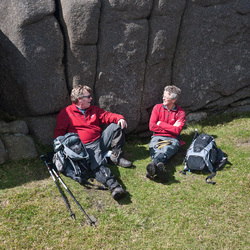 Apart from a few isolated hailstones after lunch, we enjoyed excellent weather throughout. Trip to the Isle of Arran, Scotland. On Friday, 16 March, 11 of us met at the Belfast Docking of the new Stena superfast VIII ferry. We were in convey of 3 cars and our trip on the ferry was memorable with 4 of the group in first class and the rest in steerage. A though back to the Titanic days perhaps. Once in Cairnryan we made great progress to our second ferry crossing of the day from Ardrossen to Brodick on Isle of Arran. It was back to bread rations for us all but the views to Arran were spectacular with visibility perfect. On arrival at Brodick, we preceded to Lochranza hostel which was found to be excellent, a big thank you to Frank for the choice of accommodation. The weather at this stage was damp and overcast but the weathermen were predicting a good Saturday and Sunday when our main walks would take place. A few of us took an evening walk along the shoreline and back via higher ground to the Hostel and then proceeded to the local village hotel to an excellent evening meal with various local offerings including ‘Venison’ pie which was second to none. Bedtime was looming around 11pm, so it was off we went to 2 well furnished rooms holding the 7 guys and 4 girls. Strange noises took place in the men’s dorm with yours truly having verbal abuse and items of clothing tossed at him. It’s still a mystery as to why… As for the ladies, well there’s 3 Japanese tourists wont be back in that Hostel. The evening talk was of the planned Day 3 walk taking in Arran’s tallest summit of Goat Fell. This took our mind of the Ireland vrs England Rugby match which we managed to catch in the hostel. Best not to dwell on the result. leading down to Rosa Glen. 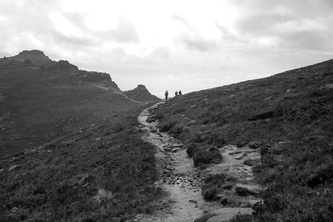 On the climb which was both breathtaking and breathless whilst approaching the steep summit, the views back to Brodick bay, the Scottish mainland and Holy Island, an island off an island were outstanding. We spotted small mammals like moles scurrying around the heather, buzzards soaring overhead and even stag deer with actual antlers. We will let Davy Wiggins explain that. The decent down along the ridge from Goat Fell was taken with care. We were blessed with light winds and dry conditions. It would perhaps be a more hairy route in bad weather. 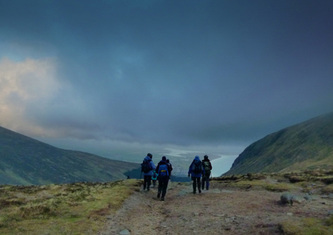 A few of the group opted for adding another summit in which was both steep and added another hour or so to the walk. Both options would include the long track down Glen Rosa and back to tour start point in the evening light. All in all, a fantastic weekend leaving great memories to ponder on. To Frank, well done, planned and organised from all the group!! 21 of us met at 10.30am in Dromara on a Sunny but cold morning. We left cars at the old Slieve Croob Inn (now sadly demised) to be collected at the end of the walk and then proceeded to our start meeting point at Windy Gap. Slieve Croob Inn, suddenly blizzard conditions enveloped us to add to the atmosphere. All ended safely at the Slieve Croob inn followed by something to warm our souls at O'Reilly in Dromara. Thanks to all for the chat en route and to the official expedition photograper Nigel. There were 10 of us on the walk from the Game Keepers Lodge carpark and up the Lough Shannagh track and ascending towards Slievenaglogh. The weather was very misty and although not raining, the ground was very wet and slippery underfoot. First tea break was at the top of Slievenaglogh before we set off to reach the cliffs above Silent Valley (with a slight variation on the way).The mist was lifting slightly and we could get little glimpses across the dam and towards the wall of Ben Crom Reservoir. across, we followed the Miners Hole River up to where it intersected with the Lough Shannagh Track and made our way back to the car park. 16 walkers turned out for Sammy's walk. We met at Trassey car pk at 10.30 and followed Trassey Track to the Sheepfold. We then turned off the track and walked North over very soft and wet ground keeping to the right of a wall to cross a little stream that comes down from between lukes, and Slievenaglogh Mt and flows into the SHIMNA river and continues on through Tollymore. Continuing NE we arrived at a track which heads up in the direction of the saddle between the two Mts before mentioned.Heading in the same direction NE we came to the summit of LUKES MT. The weather was clear,dry, and with virtulally no wind at all we arrived at the top of Lukes to enjoy a good view,and a ewll earned brew,which everyone enjoyed very much. Then we made our way down to the saddle and began what was to be the main challenging climb of the day to the top of SLIEVENAGLOGH. day, and to learn how BEAR GRILLS would survive by melting snow to make a pot of soup. After lunch we followed the wall over Slieve CORRAGH to leave the wall at the saddle before the wall continues on up over COMMEDAGH. group left the saddle following a little stream SE to join the Brandy Pad at Grid 336282. After another short stop and a cuppa,and watching our four friends leave Commadagh and making a fast desent down, we made our return, following the path to Hares Gap and down to the car park. A six hour walk in good winter conditions,enjoyed by all. 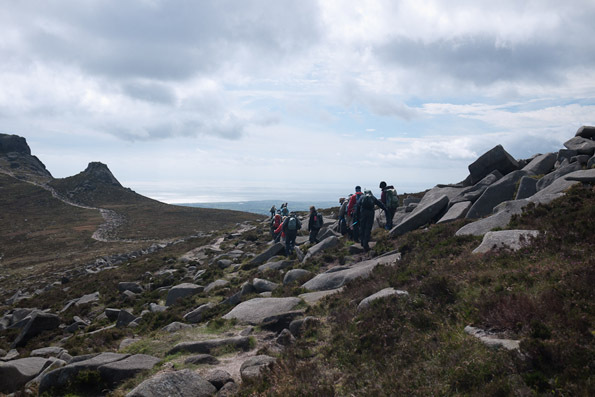 There were 20 walkers in Donard Car Park on Saturday morning anticipating our ascent from sea level to the highest point in the Mournes. We set off and climbed through the forest beside the Glen River before turning south east and walking above Lindsays Leap before ascending Millstone Mountain where we paused and took in the view to Crossone with the profile of Chimney Rock Mountain beyond. Slieve Donard rose above us, it's top shrouded in cloud. As we climbed to the top of Donard and the Great Cairn and Mourne Wall appeared out off the mist, we noticed a little frost on the ground. 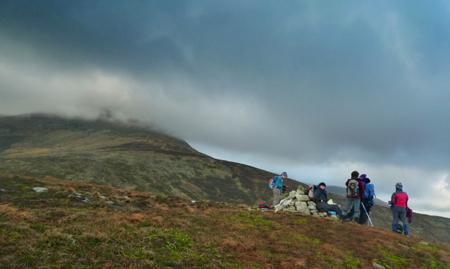 Sheltering behind the wall, we lunched before descending south west towards the Bog of Donard. Meeting the Brandy Pad and making our way up to the saddle with Commedagh we saw our route back to the starting point lying before us down the Glen River Path. daylight faded, our thoughts turned to the promised rendevous in Mauds for a well deserved cuppa. Thanks Mike for a great walk.